The official name of this global celebration is the International Year of Astronomy, abbreviated IYA2009. The official slogan of the IYA2009 is "The Universe, Yours to Discover". 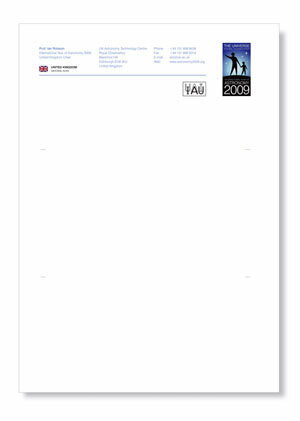 The official logos of the IYA2009, which also incorporates the slogan, appears on this page in several formats. We can provide versions of the logo with the text translated into other languages; e-mail your translations to iya2009@eso.org. We encourage widespread use of the IYA2009 logos by individuals and groups who organize or support IYA2009 activities. An IYA2009 "activity" is here understood to be an event, exhibit, performance, commercial or promotional product, print or electronic publication, or other creation intended to advance the aims of the IYA2009 as described elsewhere on this website. In order to use the IYA2009 logos you need to provide contact information and a brief description of your IYA2009 activity/product to your National Node Chair, including the URL of your IYA-related website, if applicable, as well as time and place. If the country in which you are organizing an IYA activity/product does not have an IYA2009 National Node Chair, or if the activity/product is of an international nature, you will provide the required information to the IAU's IYA2009 Secretary instead. 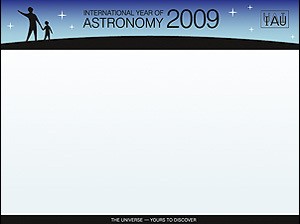 If you use the IYA2009 logos on a website or in any other electronic publication that supports hyperlinks, you should link to www.astronomy2009.org as well as to your National Node's IYA2009 website, if applicable. As a rule of thumb, the IYA2009 logos must not be modified. Please contact the IYA2009 Secretariat in case of doubt (please submit your graphics). The IAU Officers and the IAU Executive Committee Working Group for the IYA2009 reserve the right to revoke the use of the logo by any individual or group at any time for any reason, and you agree to promptly comply with any such revocation. All IYA2009 National Nodes are required to show the IYA2009 logos on their Web pages and on any printed or electronic materials produced to support the IYA2009. All other organizers and supporters of IYA2009 activities are encouraged to do the same. Note: All use of the UNESCO|IAU logo shall only occur with the explicit permission of the IYA2009 Secretariat in writing, and shall only be used for the event or events covered by that permission and that any use which in accordance with such permission shall be reported immediately to the National Node and the IYA2009 Secretariat for corrective action, failing which the IAU reserves the right to withdraw permission to use the IAU logo. Cornerstone projects' official logos, in various formats for download, can be found on this link. If you would like a web banner similar to the one for the UK shown below, please e-mail prusso@eso.org.